Check out our picks for the best RV insurance companies including RV insurance cost, tips for buying an RV policy and more. The Good Sam Insurance Agency is a multi-carrier agency made up of a network of some of the nation’s top-rated insurance companies. RV coverage with your car, truck or SUV policy can result in savings up to 30 percent or up to $521 per year. RVInsurance.com has insured over 100,000 RVs in 48 states by partnering with 20 other top-rated carriers, including Nationwide, Foremost, National General and Safeco. 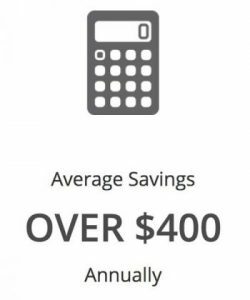 The average savings they offer customers amounts to $335 to $400 per year. RV America works with some of the most well-known insurance companies like Progressive, National Interstate, Allied and Blue Sky. Aside from standard coverage, RV America offers a large selection of optional coverage that can protect you in nearly any situation. We evaluated 23 RV multi-carrier insurance companies and selected the three best choices after carefully researching each one. We ranked each RV insurance company by a variety of criteria including policy types, price, and customer feedback when we made our assessment. The companies that ranked highest are Good Sam, RVinsurance.com and RV America. In this guide, we will discuss important factors to consider when choosing RV insurance, RV insurance shopping tips and detailed evaluations of each of our best companies. You will also find helpful frequently asked questions about RV insurance in this guide. Shop around. Don’t assume that your current insurance company is offering the best deal. Be sure that your insurance is compliant with your home state’s RV insurance laws. Insurance requirements vary by the state you live in just as licensing requirements do. Check to see what kind of savings a company offers if you bundle vehicles or services. Whether your RV is your full-time home or your part-time home away from home, it’s much more than just another vehicle. An RV insurance policy that offers ample coverage while giving you the best value for your dollar can provide you with peace of mind without breaking the bank. Those who live and travel in their RVs will need more comprehensive, full-time coverage than those who only travel part-time. If you have a dog on board with you, an add-on that covers you in case your pooch bites someone is wise. Your state may also require additional coverage if you do business while on the road in your RV. Personal liability insurance should also be a consideration, so you are covered if someone is injured while you’re parked. Some companies and policies include this type of event as a part of the RV policy overall, much like homeowner’s insurance, but others don’t. If your state doesn’t require it, add personal liability coverage to your policy whether you’re on the road or at the campground. If you are shopping for an RV and trying to plan for insurance costs, be sure of the type of recreational vehicle you will be driving and living in. Like any insurance policy, RV insurance premiums depend on multiple factors including the cost of the RV itself. RV Premiums can cost as little as $65 per year or reach well into the thousands if you have a top-of-the-line luxury RV. Read our RV Buyer’s Guide to understand each type of RV and for buying tips before you start looking into insurance quotes. There are six basic types of RV insurance coverage available: comprehensive, collision, liability, contents, medical payments and personal injury protection. It’s important to understand these coverages and how most RV insurance policies are a combination of them. Deductibles and coverage limits (the maximum amount your policy will pay) may be different when comparing policies from various companies. Coverage limits will apply to each type of protection separately. Collision coverage If your RV is damaged in an accident, collision coverage pays for repairs or replaces your RV. Collision coverage may also insure built-in features inside of your RV like sinks or a permanently installed TV. Comprehensive coverage This type of coverage pays for repairs or replaces your motorhome when you suffer damage from an event other than a collision. Comprehensive coverage includes things like falling debris, fire, hail, theft, vandalism or water damage. Contents coverage This type of coverage helps pay for items inside of your RV if damaged during a covered event. When considering how much of this coverage you may need, be sure to think of all of the things that make your RV your home when you’re on the road: appliances, cameras, clothing, computers, electronics, firearms, golf clubs, jewelry, kitchenware, tools, etc. Liability coverage This type of coverage helps pay for property damage and medical bills to the other party when you are in involved in an at-fault accident. Medical Payments coverage This type of coverage helps pay for expenses like medical bills and funeral expenses incurred by you or your passengers in an accident. Personal Injury Protection This type of coverage, which is available only if you live in a no-fault state, helps pay for expenses like medical bills, lost wages and funeral expenses that result from an RV accident. The Insurance Information Institute names 12 states and Puerto Rico as no-fault states. Additional coverage options may include total loss or full replacement coverage, campsite and vacation coverage, emergency expenses, towing and roadside coverage, full-time coverage if your RV is your full-time residence and uninsured and underinsured motorists coverage. If your RV is drivable as opposed to towable, a minimum amount of liability insurance is required by law no matter which state you call home and whether your motorhome is paid off or still being financed. Some states also require uninsured and underinsured motorists coverage. Comprehensive, collision, contents and medical payments coverage are optional unless you are paying off a loan on your RV. Your lender will most likely require comprehensive and collision coverage. Your automobile liability policy may cover a towable RV. However, whether other parts of an auto policy would cover a travel trailer pulled behind your insured vehicle depends on the terms of your policy and guidelines of your insurance carrier. In some cases, the trailer would have to have its own comprehensive or collision coverage. Just because you don’t have to have extra coverage with a towable RV doesn’t mean you shouldn’t buy it. Make sure you consider how you’ll cover your costs if you are in an accident and don’t have adequate coverage. 1. We searched an extensive list of over 20 companies. 2. We evaluated the type of companies based on our expert-guided buying criteria: policy offerings, cost, coverage, value and service. 3. We provided you the best RV insurance companies for consideration. Even though the majority of car insurance companies issue RV coverage, there are also specialized groups that only write RV policies. With so many options and varying amounts of coverage, knowing where to start your search can be daunting. In the event of a total loss, not enough insurance can leave you homeless while overpriced or unnecessary coverage can leave you too broke to travel. Luckily, we did the hard work for you. Our in-depth analysis focuses on each company’s industry reputation, the variety of offerings and other criteria. We researched the top 20+ companies that offer RV insurance from multiple carriers. Then we narrowed the list to our top three based on specific criteria we set by extensive research of the things most important to consumers: policy offerings, cost, coverage, and service. The result was a list of three of the top RV multi-carrier insurance companies. After our evaluation, we chose the best RV multi-carrier insurance companies. Each of these companies stood out from the competition. Screenshot: Good Sam RV Insurance Club. The Good Sam Insurance Agency is a multi-carrier agency made up of a network of some of the nation’s top-rated insurance companies: National General, Progressive, Safeco and Foremost. For over 50 years, RV owners have been trusting Good Sam to take care of their insurance needs while saving them money. Bundling your Good Sam RV coverage with your car, truck or SUV policy can result in savings up to 30 percent or up to $521 per year. Each RV policy that Good Sam writes comes with features built in at no extra charge. These include $3,000 Personal Effects Coverage and Permanent Attachments Coverage for awnings, antennas and satellite dishes. Storage option to suspend collision and liability coverages when your RV is in storage for 30 days or more, saving up to $400 a year. Full-time RVer coverage includes personal liability, medical payments to others, personal belongings coverage and emergency expense allowance. Emergency expense allowance covers the cost of food and lodging if a covered accident ever leaves you stranded a hundred or more miles from home. 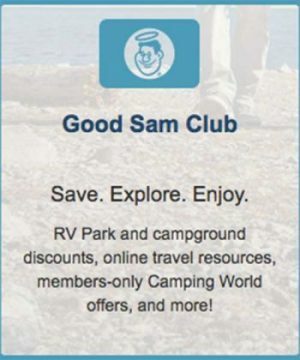 Good Sam also offers several discounts to customers like multi-vehicle discount combining RV and auto on one policy, multi-policy discount bundling homeowners and RV insurance, and a paid in full discount for making an annual premium payment vs. monthly payments. The Good Sam Insurance Agency is a Better Business Bureau accredited business with an “A+” rating. RVInsurance.com is a specialty RV Insurance carrier with roots that go back almost 80 years. The agency has insured over 100,000 RVs in 48 states by partnering with 20 other top-rated carriers, including Nationwide, Foremost, National General and Safeco. The average savings they offer customers amounts to $335 to $400 per year. RVinsurance.com offers coverage for all types of RVs: Class A, Class B, Class C, Fifth Wheel, travel trailer, Airstream, Camper, bus conversion, toy hauler and pop up tent trailer. If you’re looking to bundle coverage to get a reduced rate, they also sell auto, home, renters, motorcycle, and boat coverage. National General backs RVInsurance.com and is the parent company. It is top-rated for financial strength with AMBest and gets top ratings from the Better Business Bureau. RV America works with some of the best insurance companies like Progressive, National Interstate, Allied, Blue Sky, American Modern, McGraw, Dairyland, Assurant, Foremost, SafeCo, Mercury, Metlife, and GMAC. In addition to insuring RVs, the company also insures boats, motorcycles, collector cars and mobile homes and offers homeowners and auto coverage. Bundling policies can result in a discount. Whether you’re driving a Class A, Class B, Class C or medium duty truck pulling a fifth wheel, travel trailer or are carrying a truck camper, RV America can find you lower rates for excellent coverage. Aside from standard coverage, RV America offers a large selection of optional coverage that can protect you in nearly any situation, incluidng damage from low branches. RV American Insurance is not BBB-accredited but has an “A+” BBB rating. 24/7 Roadside Assistance includes towing, locksmith, breakdown, battery failure, flat tire, fuel delivery and entrapment in snow, mud, water or sand. Accessories Coverage covers awnings, antennas, satellite dishes or other attached accessories even if you add them after you purchase the RV. Emergency Expenses pays for temporary living expenses such as hotel and rental car if you are involved in an accident while more than 50 miles from home. The standard coverage amount is $750 for each occurrence. Coverage for full-timers may be available up to $2,000 per incident. Fire and Flood covers your RV and contents. Full-Timer Coverage provides comprehensive insurance that includes personal liability coverage which pays for bodily injury and property damage caused by an accident in which you are held liable. High Liability Limits policies start with liability coverage at $100,000 per person, $300,000 per accident and $50,000 in property damage. Optional coverages include up to $1 million of liability coverage. Low Branch Collision pays for damage to your RV and attached items like awnings and A/C units. Personal Items Replacement policies start at $2,000 of coverage. Best practice is to keep an inventory of furniture and other items in your RV. Total Loss Replacement ensures that you get a brand new RV if an accident destroys your current RV within its first five model years. After the first five years, the coverage will pay the original purchase price toward the cost of a new RV. Readers of this RV insurance guide also found these related articles helpful. Read about how to protect your new investment with an extended RV warranty or RV insurance, and see if you need both. An RV acts as a mode of transportation and your home away from home. 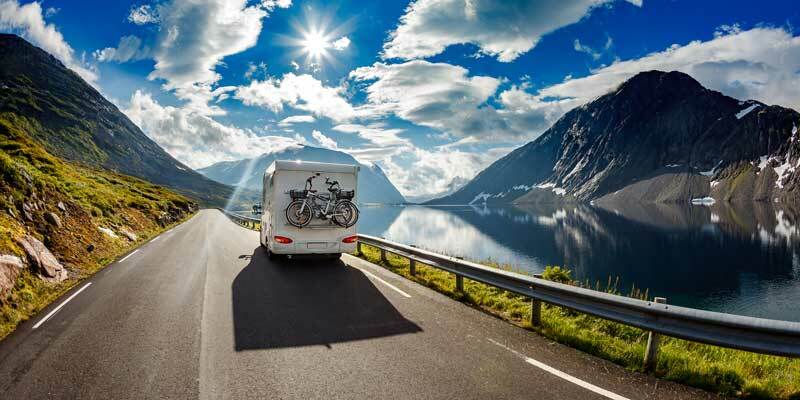 See how you can get an RV insurance policy that covers automotive and homeowners issues. Are there any discounts on RV insurance? Yes. Many insurers offer various discounts, and some can significantly reduce your annual RV insurance costs. Most companies offer discounts for safe drivers, for those with good payment histories and for customers who bundle their RV coverage with their auto, motorcycle or home insurance policies. Another RV insurance discount is the disappearing deductible option, which reduces deductibles for as long as you remain claim-free. A storage option saves money by temporarily suspending some coverages while your vehicle is not in use. Some companies offer discounts for taking a driver’s safety course, having anti-lock brakes or a security system. Some insurers and RV groups or clubs offer additional perks, so be sure to find out what’s available before finalizing a policy. Will I be covered if I travel out of the country in my RV? RV insurance coverage from the U.S. won’t cross the border into Mexico with you, so if you’re planning to go south of the border, check with your carrier to see if they can help you get coverage that will work in Mexico. If you’re heading to Canada, be sure to check your policy to make sure that your coverage will be in effect in that country. Will FEMA replace my RV if it’s my home and a flood or other natural disaster destroys it? The Federal Emergency Management Agency (FEMA) doesn’t recognize RV disaster damage even if your RV is your primary residence because RVs aren’t attached to a foundation. “Licensed vehicles, campers, and travel trailers are not considered insurable buildings under the NFIP unless they are attached to a permanent foundation.” NFIP refers to the Natural Flood Insurance Program. If I tow a trailer behind my RV, is it covered? Coverage for trailers pulled behind an RV is policy-specific so be sure to confirm trailer coverage with your insurance agent. Do your homework before settling on an RV insurance policy and make sure that your coverage levels are sufficient for your needs and budget. It is vital that consumers find the insurance company that fits their needs when shopping for RV insurance. Don’t be afraid to ask about available discounts, payment options, claims resolution times, and company policies on adding or changing coverage. Our three choices for RV insurance companies are available in most U.S. markets, and they all offer a wide range of policies and service levels.